This year Black History Month observance coincides with challenges to human rights and human dignity emanating from the administration of President Donald Trump. The chaotic scenes at the airports, the denial of entry on dubious grounds to potentially thousands of human beings constitute a reminder of the importance and relevance of the African American struggle for equality and dignity to the US and the rest of the world. The struggle continues and the celebration of Black History Month connects with the ongoing struggle of Muslims, immigrants and the plight of the refugees. Black History Month, which begins on February 1 and ends on Feb 28, 2017, is a time to commemorate, recognize, highlight and celebrate the achievements of African Americans, achievements that have enriched all society- indeed the whole world. We celebrate our own humanity by recognizing and appreciating the many contributions of African Americans that have benefited the US and the world. Black History month serves an important educational role. While all Americans are familiar with African American luminaries such as Dr. Martin Luther King Jr., Malcolm X, Rosa Parks and Muhammad Ali, many are not familiar with the many other contributions of African Americans in all fields of life. “African American history is American history. 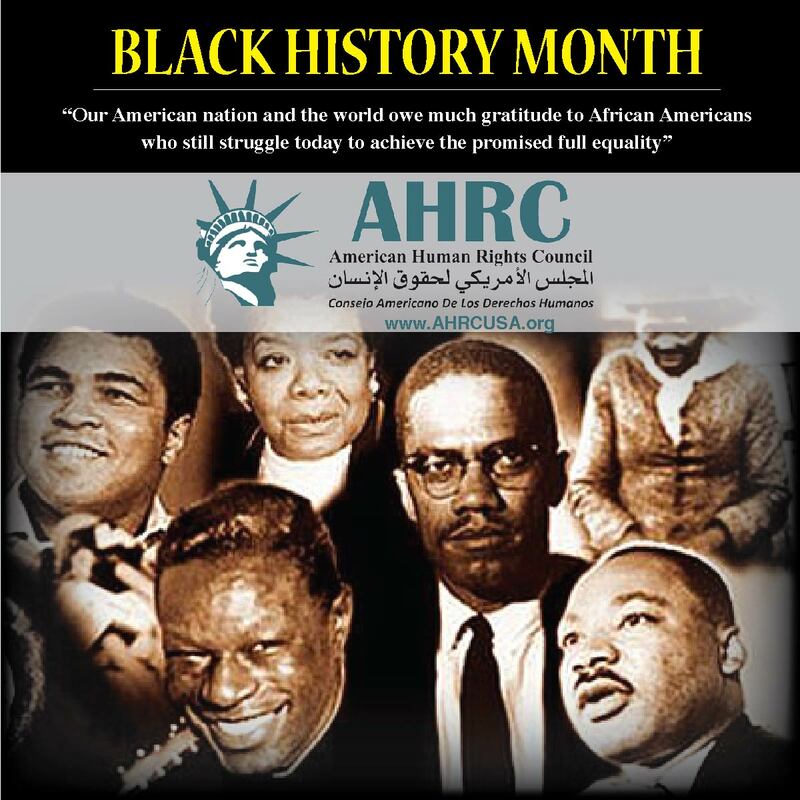 Black History Month is a great opportunity to learn about the many contributions of African Americans to America and the world,” said Dr. Opada Alzohaili, AHRC President. “The scenes at the airports and the mistreatment of fellow human beings for no fault of their own remind us that the struggle for human rights and human dignity continues,” said Imad Hamad, AHRC Executive Director.